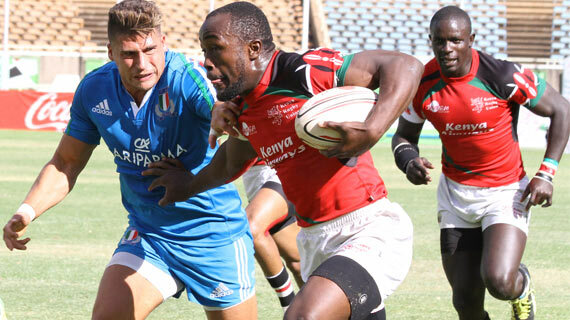 Kenya sevens rugby team – Shujaa- exited the Vancouver Sevens, the sixth round of the 2016/17 HSBC Sevens World Series with a 26-7 defeat Challenge Trophy semifinal loss to Samoa at the BC Place on Sunday night. Samoa took a 14-0 lead into the interval, the first try the result of classic following up on the inside by Alex Samoa after a perfect line-out and offload from Tila Mealoi as the Samoans struck first. They weathered all the early pressure and Sir Gordon Tietjens's side got the first five-pointer, before Joe Perez put on the afterburners and raced to the line with a neat little sidestep. Shujaa's Sammy Oliech would make something out of nothing, doing well to shrug off his defender, break free while tucking the ball into the correct hand before racing clear to score and convert. Perez brilliantly fooled the Shujaa Sevens backs into thinking he was searching for a pass, before twisting superbly and surging to the line. Savelio Ropati's fourth career try wrapped up the Samoan win.